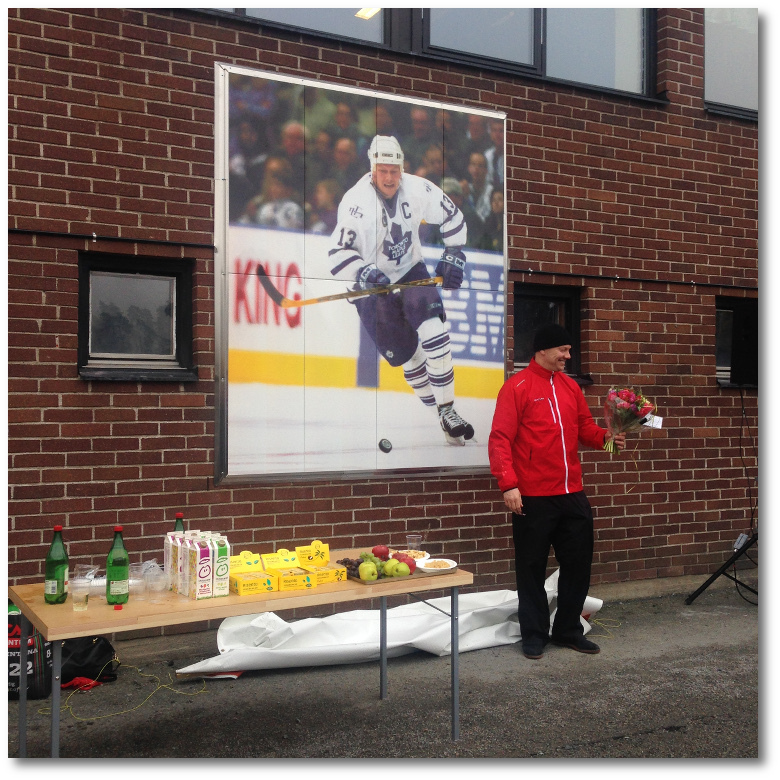 Every time I walk past that big photo of Mats Sundin chasing a puck, I think back to that February day a few years ago, when they unveiled it. Mats was there, running a hockey school for newly-landed migrant kids – from Iran, Uganda, Afgahnistan – and he was wearing a track suit and a black beanie. The Sollentuna town council representative held a speech, standing on a tiny, very provisional stage. There was a thermos with coffee, and a box of cookies to go with it. It was not a black-tie event. “This is perfect,” Sundin said and smiled. “It’s one thing to get accolades in Toronto where I played most of my career, but this is extra special, because this is truly where it all began,” Sundin told me. The first time I was in Sollentuna was in October 1999, I had no idea I’d be back. I parked my black BMW on the upper parking lot and walked down the concrete stairs towards the arena, thinking my beer league rink bandy game would be indoors. It wasn’t. It was outdoors and it was cold. It was wasn’t the last time I was in Sollentuna. I’m in Sollentuna right now, writing this in the small garden of a yellow Sollentuna house while my Sollentuna girl and our two children are inside, doing whatever Sollentuna things they’re doing inside. See, two months after that rink bandy game I decided to cut my Finnish Xmas break short so that I could welcome the new millennium with a Sollentuna girl who had – very casually – told me that if, by any chance, I had nothing better to do on New Year’s Eve, there was this party that she was maybe sort of throwing and, well, it could be fun if I showed up. I sort of kind of made absolutely sure I was there so there we were, a house full of Sollentuna kids, and one Finn from the south side of town, taking in the 21st century. A few years later, my rink bandy team scheduled in extra practices in another Sollentuna rink, you know, to work on the details of the game. It was in one of the games in that league that I witnessed the most Swedish of things take place a couple of years later. It had been one of those warm winters we’ve seen too many of lately, and there was a lot of water on the ice. Not a big deal in the grand scheme of things, but a big cause for annoyance at the time. There was no way to pass the ball to a teammate, because the ball just splashed water around it when it landed wherever it landed. Our goalie threw a long pass towards the other end, and one of our players chased the ball as their goalie rushed out to grab it before him. The goalie made a slight miscalculation, and missed the fact that the ball would land and stop in the huge puddle in front of the net. The goalie was on his way to the right, the ball was right in front of the empty net, two meters out, and Christer – now seeing the big picture – realized he could just shoot it in. He also saw the goalie on the ice, all wet, and it seemed that he looked back at the bench to us. Then he grabbed the ball, apologized to the goalie, and scored the goal. That extra practice, the first and only practice we ever held, was held in a classic no-frills outdoor rink in northern Sollentuna. It was an old schoolyard rink, with wooden boards and choppy ice, and of all the guys on the team, no-one was more important that Bosse. Now, Bosse was a smooth-skating defenseman, a former bandy player who could take the ball from one end of the rink to the other at will. He could, and often did, also take a four-minute shift without breaking a sweat. But that practice nice, he was key because he was the guy who made sure there was ice to begin with. It was that night that I heard Bosse mention Patric Hörnqvist’s name for the first time. Hörnqvist had just been drafted to the NHL, from Swedish Division 1, which was surprising. Bosse was as surprised as the next guy, but he also said that Hörnqvist was tough. “He’ll never give up,” Bosse said. “And he can shoot.” he added. Our team was called Gillbo Boys. Hörnqvist’s first team was Gillbo IF and it was in that no-frills outdoor rink that he had learned to skate and shoot – and to never give up. “There was one man who was really enthusiastic and made sure the rink was flooded and cleared of snow. His name was Bosse Eklöf,” Hörnqvist told me during the 2016 World Cup of Hockey. When Bosse said Hörnqvist wasn’t one to give up, he knew what he was talking about because he never gave up himself, either. Rain or shine, he made sure there was ice so the kids could play. So when Hörnqvist woke up in his room in Sollentuna one August morning in 2005 to his father telling him he’d been drafted to the NHL, the fact that he had been drafted as the last player of the entire draft barely registered. Then again, he hadn’t played in the top Swedish league, either. Nor in the one below that, but in the one below that. “It’s pretty cool, I don’t think many Division 1 players get drafted to the NHL. I didn’t care whether the chance of my getting to the NHL was big or small, I just knew there was a chance. Somebody out there believed in me,” he says. Five years, two World Championships, and about a season’s worth of play in the NHL later, in February 2010, Hörnqvist represented Sweden (and Sollentuna) in the Olympics. Bosse was in the stands. Eleven months after the New Year’s party, my future-brother-in-law suggested playing hockey on Xmas Eve morning. It had to be in the morning because at 3 pm, Swedes park themselves in front of the TV to watch the Disney Xmas special, and then there’s the dinner, before Santa comes knocking, but at ten in the morning, there’s not much else to do, so hockey it was. Brother-in-Law wasn’t a hockey player – he was a tennis ace – but back in the day, when he had played hockey, in the same Sollentuna club as Mats Sundin, he had gotten a pair of hand-me-down pants that had belonged to Mats. And if you can’t win the Stanley Cup, that’s a pretty good consolation prize, if you ask me. Several years in a row, we headed out to the Sollentuna outdoor rink only to find out we had come just a tad late to play with Brother-in-Law’s old friends, real Sollentuna players, who had left town to play for bigger clubs in bigger leagues, but who, once a year, returned to the old rink. We never played with them, but sometimes Brother-in-Law wold chat with them a little, and then, as we rode back home, we vowed that the next year, we’d get there earlier. In 2002, I took my Sollentuna girl – who, coincidentally, had once represented Sollentuna in a high-jump meet in Finland, because Kajsa Bergqvist, the other person on Sollentuna’s Wall of Fame, was unable to do it – to live in Helsinki, my hometown. Naturally, when Finland hosted the hockey world championships in 2003, Brother-in-Law and I were in the stands for the classic Finland v Sweden derby. He was proudly wearing Sweden’s national football team’s yellow shirt and was confident that Sweden would win. After all, the guy whose old pants he had once worn was on the ice. Somehow, though, Finland took a 5-1 lead before the game was halfway through and by each Finnish goal, he got more discouraged, and then zipped up his hoodie to hide his colors. Then came the comeback. First 5-2, then 5-3 and 5-4 and and by the time Sweden scored their fifth goal, the hoodie was off again, and Brother-in-Law was filled with hope again. And then, with five minutes remaining in the game, Sundin won a faceoff, and Axelsson re-directed a shot in to win the game for Sweden. By brother-in-law was jumping up and down in the stands, and on the ice, Sweden’s big number 13 jumped on top of his teammates celebrating the win. 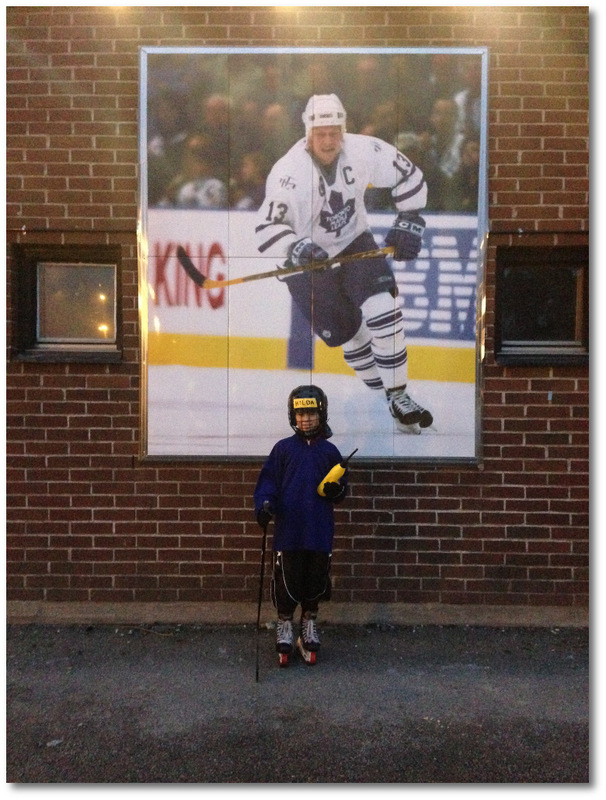 “Mats Sundin proved that it was possible for somebody in Sollentuna to go all the way to the top, and that was important mentally. You always need good role models,” says Hörnqvist, who’s now a two-time Stanley Cup champion with the Pittsburgh Penguins. Maybe Hörnqvist, too, wanted to be a good role model when he offered to help out another kid a few years ago. The kid had been drafted to the NHL in the first round by the Anaheim Ducks so he had joined the Swedish NHLers for their off-season skates. “He didn’t have a driver’s license so I gave him a ride to and from practices,” Hörnqvist says, with a laugh. That kid’s name was Rickard Rakell. He’s from Sollentuna, too. Mats Sundin was Rickard Rakell’s idol. 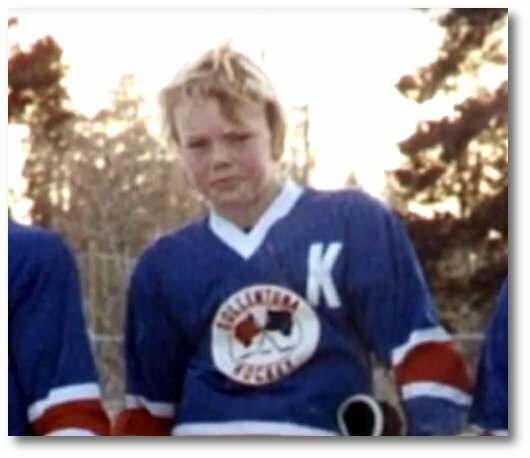 His father build him and his brother a backyard rink in Viby, and that’s where he pretended to be Mats, or at least, just like Mats. One day, he too would play in the NHL, play for Sweden. “My grandma used to work at the Sollentuna golf club and one day, she called me to tell me that Mats was playing in the club championship tournament. I grabbed my Toronto Maple Leafs sweater and dashed out to the course and waited for Mats at the 18th hole so he could sign it,” Rakell says with a big smile. “And he did,” he adds, with an even bigger smile. “I started to play hockey at the Sollentuna hockey school and even though I left the local club pretty early, I came back as a 14-year-old and played for their under-18 and under-20 teams,” he said. That’s the usual story. The Sollentuna boys – Niklas Svedberg, Andreas Lilja, Per Eklund,Tomas Kollar, Oskar and Calle Steén, Dmytro Timashov – leave for bigger clubs to have a better shot at making it, leaving their hockey pants for the next generation of hopefuls. Rakell’s big brother, Robin, made the same move, but he returned to Sollentuna. So did their cousin Christian Holmblad now that Sollentuna’s team is back in Division 1, that third-tier league in Sweden where the Predators found Hörnqvist. Today, Rakell is an NHL star, having played more than 300 regular season games with the Anaheim Ducks, and having reached the 30-goal milestone twice in the last two seasons. In September 2016, he made his Team Sweden debut in Helsinki, Finland. Mats Sundin was in the stands, as a Team Sweden advisor. “It was an amazing debut,” says Rakell. Today, he’s a Team Sweden superstar. I’m at the Sollentunavallen almost every day, if not as an associate assistant soccer coach, then a bandy or ringette coach, or watching the kids’ track practices or selling hotdogs at a game. These days, I never park my car up where I parked that first time, and instead, park it to the other parking closer to the practice rink. If I don’t drive, I ride my bike but I never take the bus, because I’d have to change buses at the mall, and it’s not worth it. It’s only a ten-minute bike ride. 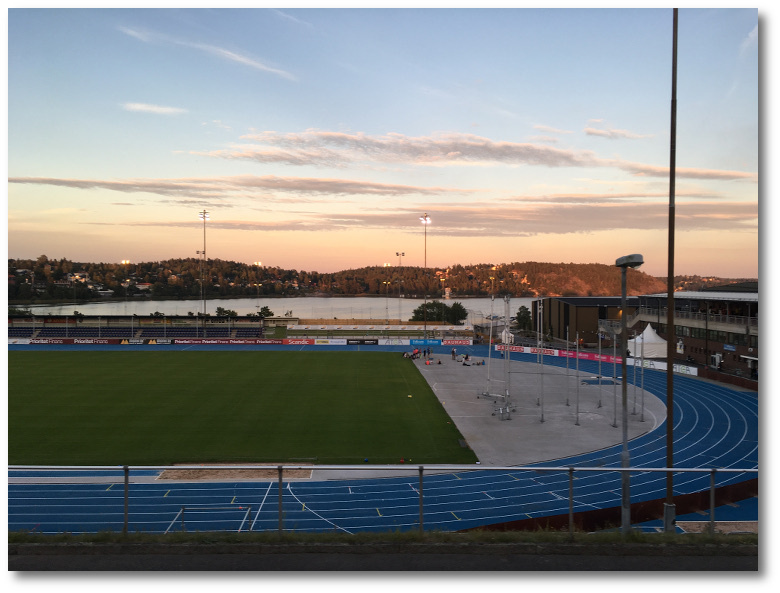 However, every time I’m there, I look out over the track field, the bandy/soccer field and the arenas, and the bay, and I try to imagine what it looked like when Mats used to take the bus there. When Sundin took the bus to Sollentunavallen, there was no arena, only the outdoor rink. The local mall was about half the size it is today but it had one thing going for it: Team Sweden coach Curt Lindström ran a small betting kiosk there. Other than that, and Ted Gärdestad, a Swedish musician, Sollentuna was mostly famous – or infamous – for Malmvägen, a street that runs next to the train tracks and is lined with apartment buildings that are part of affordable housing program, and that Sollentuna was not only home of hockey heroes, but also Christer Petterson, who was suspected, charged and convicted of the murder of prime minister Olof Palme – and who also won his appeal and was acquitted. Now, Sollentuna’s grown a lot in the last decade and when Rakell took the same bus, there was the arena and an outdoor rink. Now that’s gone, too, but some things never change: Vallen is still the heart of the suburb. Sollentunavallen is where the local team’s coaches found Timashov, a Toronto Maple Leafs draft pick who moved to Sweden from Ukraine. He was on the big bandy ice so much, working on his skating, that the hockey team’s coaches started to recognize him and pay attention to him. A couple of years ago, at the World Cup of Hockey, I told Rakell Sundin’s story about taking the bus from Viby to Sollentunavallen but as I re-told the story, I forgot the number of the bus, so I paused for a split second. Rakell flashed a big grin. “It’s the 520,” he said. This entry was posted in Heroes, Hockey, True story by Risto. Bookmark the permalink.